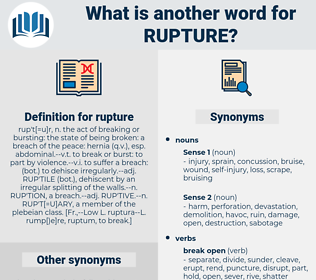 What is another word for rupture? have a go each other. rift, collapse, burst, disconnect, bursting, eruption, separation, fragmentation, breakthrough, breach, dissolution, abandonment, shearing. fracture, break-up, failure, departure, interruption, severance, termination, disintegration, disconnection, break, outbreak, breakdown, discontinuity, hernia. closure, peace, agreement, harmony, closing. friendship, union, attachment, kindness, unity, juncture, combination, friendliness, connection, marriage, sympathy. bind, secure, fasten, solder, weld, attach. fix, mend, connect, close, join, sew, agree, marry, combine, unite. The two young men parted with as scant courtesy as was possible without an open rupture. rebutter, riveter, rapture, rafter, rivetter, rooftree, refuter, repeater, raptor. herniation, slipped disc, hernia, ruptured intervertebral disc, herniated disc. rip, rend, tear up, rive, pull, rip up, shred, lacerate.